Well, I just couldn’t stop making necessary changes to this great presenter tool. So, now Start-Demo will process your multi-lines one-liners which this couldn’t be done in the previous version. # 1. Customized the foreground color to Cyan and backgroundColor to Black. # 2. Created a Dump color to default to White. # 3. Added to put back the default foreground and background colors. # 5. Modify the Help menu to acomodate changes. # 6. Commented out all "$Host.UI.RawUI.WindowTitle". # 7. Replaced all "[System.Console]::ReadLine()" with "Read-Host". # follow with a read-host similate a pause. # 02/10/2012 – Add section identify oneliners with continuation tick "`". # 02/10/2012 – Cleanup all unused V1 lines. # 02/10/2012 – Make code to properly display continuation lines. # 02/12/2012 – Fix info on Start time and duration. 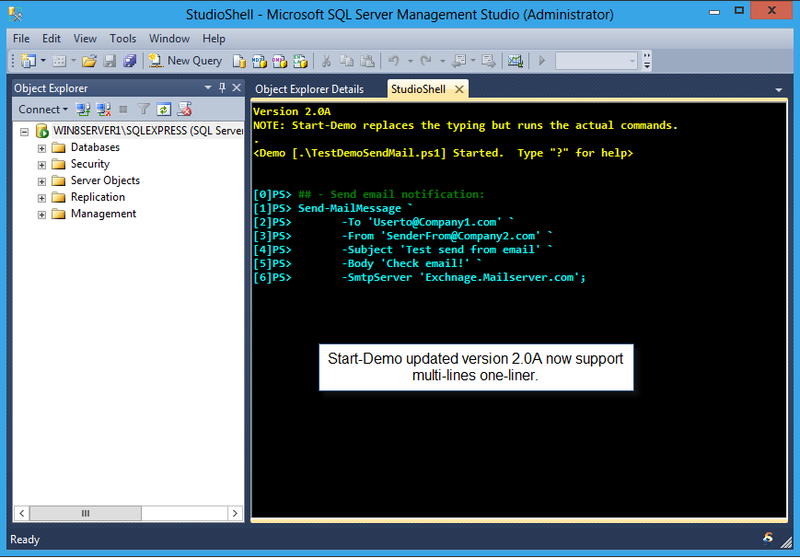 # 02/12/2012 – Adjust execution message spacing. NOTE: Start-Demo replaces the typing but runs the actual commands. $_SimulatedLine = $($_Lines[$_i]) + " "
want to run a one of these meta-commands. NOTE 2: After cmd output, enter to move to the next line in the demo. as you explain what happened with this command. NOTE 3: The line to be run is displayed in the Window Title BEFORE it is typed. This lets you know what to explain as it is typing. Write-Host -ForeGroundColor Yellow "$("*" * 25) >Interrupted< $("*" * 25)"
# Write-Host -ForeGroundColor $CommentColor ""